I am a man in my mid-30s, and I have suffered from a form of gynecomastia, moobs, to put it bluntly, since puberty. So, twenty-something years of misery, resistance to taking t-shirts off, or even wearing t-shirts in public, or shirts, in the first place, despite every other part of me being healthy and in shape. After I was treated recently by Dr Puneet Gupta, I am asking myself why he couldn’t have entered my life 20 years ago! For anyone thinking about the surgery, you’ll still be thinking about it tomorrow, next year, in five to 10 years time. Do it, speak to him today, not only will you have no regrets, it will feel like Dr Gupta has made you a new man entirely. I’d been thinking about the surgery for some time when I eventually bit the bullet and went to see Dr Gupta after a conversation with a female friend who was singing his praises. Having never spoken of the embarrassing problem with anyone, not even my partner, it was surreal to be in an office chatting easily to a man who had clearly seen this many, many times before. You will quickly learn Dr Gupta’s skills do not start and end with surgical tools, he is a thoroughly lovely man, passionate about his profession who cares more about the welfare of his patients than anything else. We spoke about the situation, how so many other men cannot shift fat from their chest with diet and exercise, and he told me exactly what was going to happen. He’ll even show you the cannulae to give you an idea of just how small the incisions are. For some men it is fatty tissue, for others it is a glandular issue, so Dr Gupta will explain to you what he sees, and how much fat he thinks he can take out. The key, he will tell you, is to ensure what is left behind looks natural. The beauty of the surgery is that you are not on any NHS waiting list – you can fix a date with Dr Gupta, and he may even be able to see you within two weeks should you be willing to go for it (authorities want people to have a 2 weeks cooling off period before agreeing to any procedure). Personally, twenty years was long enough to wait for someone to help me get rid of the fat in my chest, and I opted for a date that was as close to our consultation as possible. On the day itself you are taken to a quiet room inside the private clinic to prepare, given some medication to stop infections, and your nerves are quickly calmed. You will wear a gown and be escorted to the small theatre for the work to begin. Again, it can sometimes feel like you are having an out-of-body experience, and I can only put that down to having a weight that has pressed on your mind your entire life simply blown (or in this case, sucked) away. I was entirely awake throughout the procedure, and will recall it as best I can. 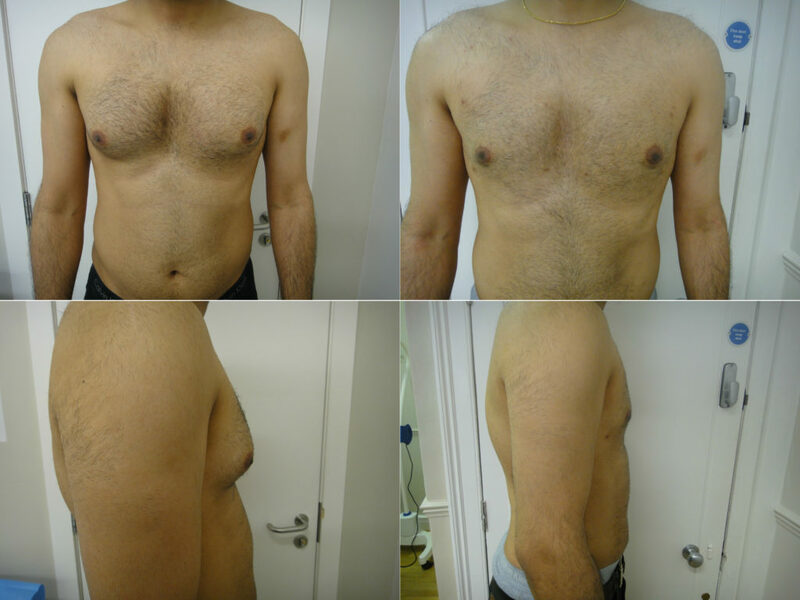 I underwent microlipo, or tumescent liposuction, which Dr Gupta was taught by its inventor, Dr Jeffrey Klein. It involves injecting a large volume of very dilute solution of local anesthesia into the fat beneath the skin, causing the targeted area to become tumescent, or in other words, swollen and firm. Fat and tumescent solution is then sucked out of that swollen area with very tiny cannulas. I felt a minor pinch, if that. The tubes are so small, and you can even see the activity if you wish, but it was nothing more than a pinprick on skin that had been marked up previously. Dr Gupta talked me through the entire procedure whilst it was happening, asking questions and even cracking the odd joke. Before long it was over, and I was sat up, and looking down to a flat chest. Something I had not seen since I was a boy. It was astonishing, and has proved life-changing. Post-procedure I was strapped into a compression garment, and went up to the waiting room for my lift to pick me up. A few hours after arriving you are off out of the clinic doors, and stepping back onto those London streets. I really did feel like my life had begun all over again. For the next two days I wore the compression garment, and had bandages on to stop leaking. As with any procedure, the anaesthetic wears off eventually, and you can feel a bit of discomfort. The usual post-procedure time-frame is a couple of weeks of rest before you can start serious exercises again, the discomfort does not last, and is a small price to pay for having the work done. Dr Gupta called regularly to check on me, and I cannot thank him enough for his support, let alone the work he had done. For the first time in my life I am happy with how my chest looks; I have more confidence, and am looking forward to the summer months where I can show off my arms and wear t-shirts again. I have also found that I am no longer slouching or moving my shoulders forward to hide the problems, and can stand up and sit up straight without fear. For anyone who has not suffered the problem of immovable moobs it is difficult to explain the combination of psychological trauma, shame, self-hatred, fear and worry that you are always feeling. You never truly get used to having a problem with your chest, and may even constantly compare yourselves to others, wondering what you did to deserve it. It may even affect your mood, as sometimes you will wear clothes that are unflattering, causing you to lose your temper with loved ones but not be able to tell them why. So for the first time in my life I feel “normal”, I feel better mentally and physically, and am excited about going to the gym for the first time in so long. I think I am more patient and have so much more confidence. In the past, I thought dieting and heavy-weights would help, but it often made the problem worse, as gynecomastia will not turn that fat into muscle. If you feel anything like me, then Dr Gupta is the only answer. I have written this testimonial because Dr Gupta changed my life; he fixed something I have spent my life struggling with and trying to find an answer for. My advice is do not go crazy in the gym, or look for supplements, or do anything extreme that can damage your health, go talk to him today and you can soon plan the rest of your life. Choosing to have this surgery was one of the best decisions I have ever made in my life and I have absolutely no regrets. I can only hope these words help other men like me get the help they need, and if you want a cure for the condition I will tell you one final time – go speak to Dr Gupta today. Choosing to have this surgery was one of the best decisions I have ever made in my life and I have absolutely no regrets. I can only hope these words help other men like me get the help they need, and if you want a cure for the condition I will tell you one final time - go speak to Dr Gupta today. Liposuction is a procedure that involves the removal of fat deposits from underneath the skin using a tube called a cannula connected to a suction or vacuum. This is carried out either under general anaesthetic, heavy IV sedation or in some cases, local anaesthetic. Dr. Gupta takes into consideration various factors including the patient’s current health status, weight and areas of treatment before advising them on the safest sedation procedure.